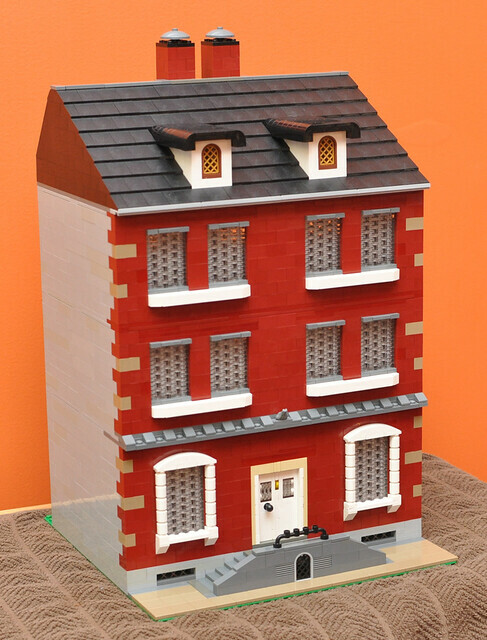 Brick Town Talk: Brownstone Brickwork - LEGO Town, Architecture, Building Tips, Inspiration Ideas, and more! Nyhavn, Copenhagen, Denmark- (BTT) In the same fabled land that the Lego brick calls home, is a beautiful city called Copenhagen, with a world-famous harbor called Nyhavn. The beautiful, colourful, and aesthetically pleasing buildings line both sides of a large canal, with the oldest dating back to the 16th century. This beautiful building would look at home in Nyhavn, or New York, with its brownstone architecture. The Legoland-style windows are a fresh idea in the land of modular buildings, and give a certiant character to the build.The front walk seems to be welcoming you in, with the frogoyle keeping a watchful eye.